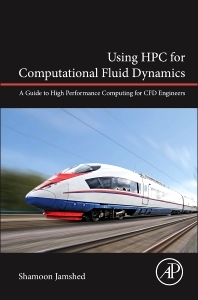 Using HPC for Computational Fluid Dynamics: A Guide to High Performance Computing for CFD Engineers offers one of the first self-contained guides on the use of high performance computing for computational work in fluid dynamics. Beginning with an introduction to HPC, including its history and basic terminology, the book moves on to consider how modern supercomputers can be used to solve common CFD challenges, including the resolution of high density grids and dealing with the large file sizes generated when using commercial codes. Written to help early career engineers and post-graduate students compete in the fast-paced computational field where knowledge of CFD alone is no longer sufficient, the text provides a one-stop resource for all the technical information readers will need for successful HPC computation. Mechanical and aerospace engineers, fluid scientists and post-graduate engineering students needing to use HPC for CFD work. 1. Colorful Dynamics or Computational Fluid Dynamics? 1. How Big Should the Problem Be? Shamoon Jamshed is a CFD Analyst at the Institute of Space Technology (IST), Karachi Centre, Pakistan. He has an MSc in Computational Fluid Dynamics from Cranfield University, UK and completed a Bachelors in Mechanical Engineering from NED University, Karachi, pakistan. He has been working in the field of CFD and HPC for nearly ten years, and specializes in mesh generation and turbulence modeling.